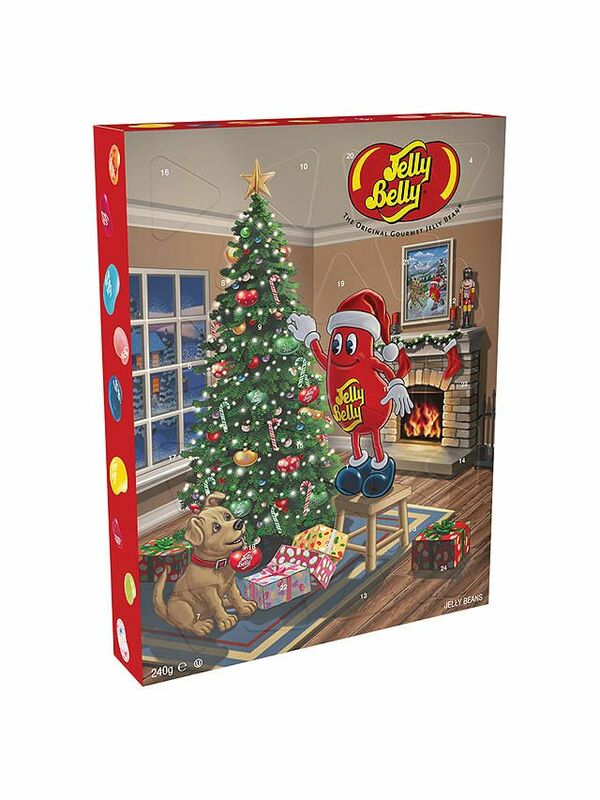 An assortment of 24 pyramid bags in assortment of 24 individual Jelly Belly flavours presented in a large advent calendar box. 24 windows to open. Very Cherry, Green Apple, Bubblegum, Blueberry, Berry Blue, Buttered popcorn, Peach, juicy pear, Candy cane, stawberry ice-cream, tutti fruity, coconut, raspberry, lemon lime, orange sherbet, caramel corn, cherry cola, candy floss, cranberry sauce, egg nog, hot chocolate, lemon, pumpkin pie, red apple, toasted marshmallow.